In this issue’s Platform (pp 10–11) Felix M. Larkin rightly takes successive governments to task for their philistine neglect of our national cultural institutions, and of the National Library in particular. Does he perhaps let righteous indignation get the better of him, however, in contrasting this niggardly approach with ‘the lavish spending of the Easter Rising centenary commemorations’? Should it be a matter of either/or? Nevertheless, in the light of Felix’s critique it does behove us to reflect on the commemoration process so far, particularly as we enter the home straight to the main events a few months hence. It is entirely appropriate that the State devote appropriate resources to commemorate its origins, no matter how complex or contentious. Fears expressed in the wake of the 2008 banking crash—that by 2016 we would have to hand the country back to the queen and apologise for the state of it—have not been realised. (By the time you read this you may—or may not—have also read the Oireachtas Joint Committee of Enquiry into the banking crisis.) And I think Felix will agree that the reflection on the Rising to date has been vigorous and multifaceted—indeed, he has contributed fulsomely himself. Moreover, apart from the official events, what has been particularly impressive has been the grass-roots activity of local history societies and community groups throughout the country. 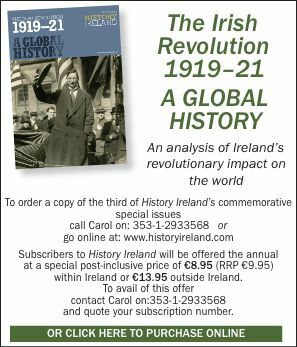 And on the subject of commemoration: over the next few years History Ireland intends to produce a series of annual publications, in addition to the regular magazine, on themes associated with various centenaries. The first of these will be 1916: Dream and death, a special edition on the impact of the 1916 Rising (further details can be found on p. 60). This will free up the magazine for more up-to-date writings on our usual variety of historical periods, which will include, of course, the revolutionary period.